Product is anything we buy from market to satisfy our needs and wants or we can say all the offerings of companies are called products. Thees may be tangible goods or intangible services or marketable offerings. but what is meant by Level of Products? Why are these levels created? I would answer these questions in my post here. Levels of product suggest that we can view a product as three products on the basis of the intangible benefits it may offer, tangible or actual product and intangible part of product. I will be explaining it here one by one. 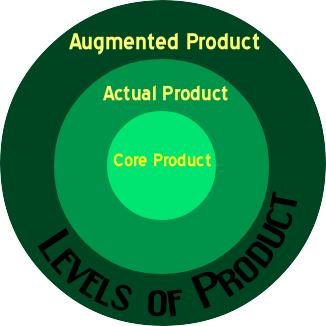 Core product talks about the intangible benefits offered by products. These benefits are valuable to the consumers because they are not only buying the physical product but also the benefits they can avail from that product. For instance, while buying a motorbike, you want speed to for quick movement from one place to other. Speed is the core benefit here. Then comes the actual product which comprises of feature, brand name, packaging, labeling of the physical product. In short it that level of product which you receive as tangible product.It means you can feel and touch this actual product. These are intangible additional services associated with the product in order to add more value for consumer. It may help creating difference from those of competitors products. Such as free maintenance services offered by auto manufacturers or warranty issued by mobile companies against the purchase of their brands. These additional services can be turned into benefits for consumers to fulfill their needs better.